Palaces evoke images of luxury, of privilege, of romance, of human drama, of idealistic dreams. There is something powerfully attractive and intensely interesting about palace life and personalities. Think living the regal life is a thing of the past? Think again. Come experience a piece of palatial living and create some memories of your own in a different kind of palace. Welcome to a 21st century vacationing palace where you are the royalty, professional staff is at your beck and call, and the beautiful Mexican Caribbean coast is your kingdom. Welcome to the Aventura Spa Palace Resort! Located just 60 minutes from the Cancun airport, the Aventura Spa Palace resort is an all-inclusive adults-only resort (18 and over) that stretches out over an 85-acre expanse of beachfront, virgin jungle, and rich botanical gardens. World renowned beaches, incredible diving and snorkeling, exploration, and first-class hotels and restaurants produce a riveting allure for the seasoned traveler and the vacationing novice alike. This region is so filled with enjoyable things to do, interesting people to meet, fascinating sites to see, and fabulous restaurants and shopping...it never gets old. 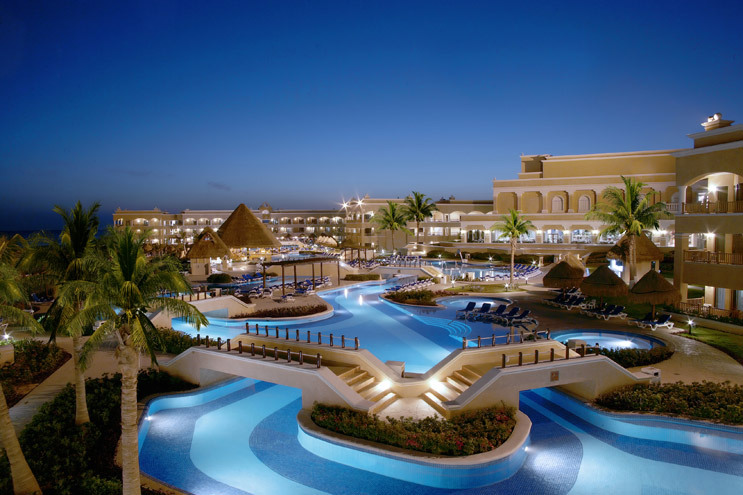 With over 770 rooms, the Mexican hacienda-style Aventura provides a broad selection of first-class amenities, and yet delivers them with the personalization of a small resort. All areas of the resort are handicap accessible. The resort offers the finest in fitness facilities. Enjoy an array of pools: cross-current marine pools with splashing waterfalls, lap pools where you can get a great workout, soothing sound pools, and other outdoor pools where you can gather and simply "hang out". Walking paths, spinning rooms, aerobic rooms, yoga hut, obstacle courses, and climbing towers all add to the rich variety of fitness opportunities. Other facilities include a spa boutique, medical evaluation center, resting lounges, and a hydrotherapy area. All-inclusive dining is absolutely perfect at the Aventura. Four tantalizing restaurants feature a la carte and buffet dining. Delicious Mexican, Mediterranean, Italian, and vegetarian specialties and other international and local dishes are served. In addition, patios, lounges, and bars feature light meals, appetizers, and refreshing drinks. For those needing conference and meeting facilities, the resort has the latest in meeting services. Enjoy access to the most up-to-date equipment, highly-trained personnel and specially-trained events coordinators; you can even arrange for theme parties and banquets. There are several styles, floor plans, equipment offerings, and room layouts to configure meeting areas to your specifications. The staff at the Aventura Spa Palace will be happy to help you plan a tour or archaeological expedition to the Mayan ruins, nearby natural parks, Scuba diving, and fishing trips. Many fun and interesting daily and nightly recreational activities and entertainment are available. You are close to many other sites and attractions, such as Cancun, San Miguel, and Cozumel. The town of Playa Del Carmen is just up the road from the resort, making it convenient to take the Playa del Carmen-Cozumel ferry and visit Cozumel Island, with its world-class reefs and diving.